On March 6, 2012, the family of Dr. Promila Mehta-Paul is offering two $10,000 rewards in connection to her case. One reward is for information that leads to the discovery of the doctor’s body. The other is for information leading to the arrest and conviction of the person or people who were responsible for her disappearance. Update: Paresh has been found. He was walking across the Mexican border into California. 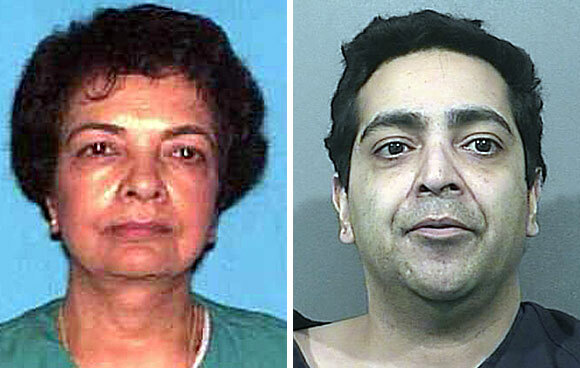 Dr. Promila Mehta-Paul, 70, has been missing from Munster, Indiana since March 21. Police are now naming her son as a “person of interest” and are asking the public’s help to locate him. Paresh Paul, 38, had been living with his mother, Promila, and was with her the night she disappeared. He also left the area aftewards. If you have any information about Promila, or where Paresh was during March 21 and March 27 or is now, please call the Munster police at 219-836-6600. Paresh also goes by the names Paul Foutaine, Omar Ahmed and Paul Asconte. He was last known to be in Los Angeles. In 2009 the IRS put a $536.550 federal tax lien against him.